Our Lady of the Rosary - Rosary Links and Resources. October is a wonderful month to start saying the rosary or to renew a practice of saying the rosary. As I was looking around the internet for some new ways to spark enthusiasm in my children for the practice I came upon these very interesting sites! This is a post I wrote about how to celebrate the liturgical year without going nuts! Pick the feasts that are important to your family and really celebrate those! My Domestic Church: A Mother's love. Some anecdotal stories about the protection of the rosary as well. Visits to Candyland: Vain repetition? My Domestic Church: A practical prayer idea. About 20 years ago my mother gave me a huge wall rosary. At the time Mr. Pete and I were very blase about our Catholic Faith, but my mom kept praying for us and giving me stuff like this. I would politely accept it and then put it away somewhere. I am so grateful that I never threw any of it out! 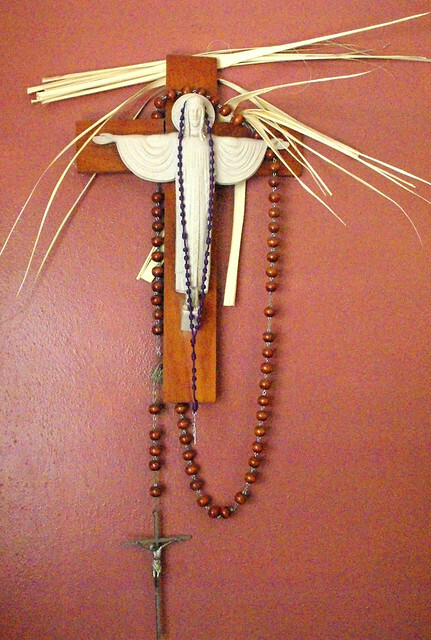 Anyway, now I treasure my wall rosary. It's beautiful. Its large beads make it very interesting for smaller children and easy for them to follow along. Coming of age in the 70's I have to say we weren't big on saying the rosary during school - in fact I'd say it was almost discouraged as being kind of old-fashioned. I didn't rediscover the rosary until I was starting to homeschool my children. I remember going to one of my first homeschool meetings and the lady leading the meeting said we were going to listen to so religious music for meditation, and then we were going to say the rosary. I remember thinking in my head at the time, "Well that's dumb. Who carries around a rosary anymore? This is going to be awkward." After the hymn, everyone started digging in their purses and voila! 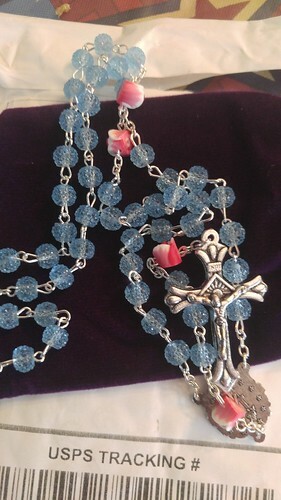 Rosaries!! Lots of them. I was so chagrined - I couldn't imagine that women my age even owned a rosary let alone carried them in their purses! I was humbled further when the kind lady next to me offered me her extra one. I've come along way since then. I have a few rosaries in my purse. A day or so after my baby was stillborn, I was talking to a very kind and holy woman. She told me that I should think of my child as a little saint because he had lived and had never committed a sin, a holy innocent. Then she said something about relics and it occurred to me that I had nothing that my baby had touched to keep with me. So I quickly went down to our religious book store and bought the prettiest rosary that I could find and afford and then I drove over to the funeral home and asked them to let me spend a little time with my baby. I remember that I touched the center piece and the cross to his little body, so this is my little remembrance of him as well as a relic. 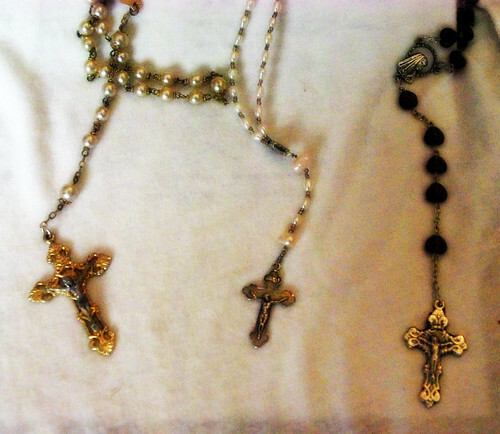 The second rosary is a gift to me from my oldest son from a year or so back. Its beads are very tiny and it is very strongly put together so I can let my granddaughter hold it when we visit church. The purple heart rosary was made for me by my sister-in-law. She made it for me herself and then sent it to me after my stillbirth. I treasure it. 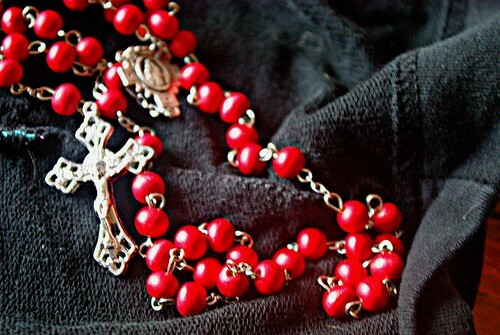 It's probably the rosary I used the most because it is strong, and I love the feel of the heart-shaped beads in my fingers. It was a great kindness of her to do that for me. 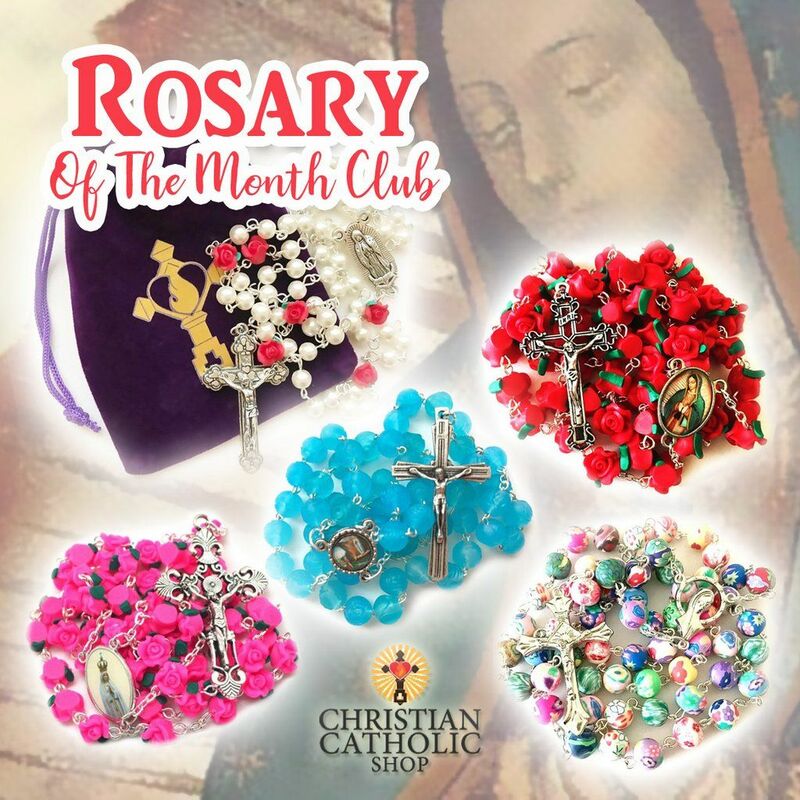 I am a happy member of the Rosary of the Month Club and have received some beautiful rosaries over the past few months!